It’s a bold move — and an exceedingly admirable one — to open the South East European Film Festival Los Angeles with Vlado Škafar’s stridently original Dad (Oča) from Slovenia. Yet this festival has never been afraid of innovative and artistic programming. For four days, April 28 – May 1, it will showcase something for almost everyone: new features, documentaries, short films and even 3-D animation from Bulgaria, Slovenia, Greece, Turkey, Romania, Serbia, Croatia, Bosnia, Macedonia, Cyprus, Kosovo, Albania, Hungary, Italy, and the U.S. at the Goethe-Institut Los Angeles, 5750 Wilshire Blvd., Suite 100 and through the Institut’s Kiosk Program and On-Demand Daily schedule. On Monday, May 2 the festival moves to the UCLA Faculty Center for the SEEFEST Business Conference at 8:30 a.m. and the UCLA James Bridges Theatre for its Closing Night Gala, Gypsy Spirit: Harri Stojka, A Journey from Austria at 6 p.m. (tickets and full schedule at www.seefilmla.org). Vlado Škafar has won kudos not only in his native Slovenia where Dad, a highly stylized fiction film, is the middle work in a trilogy that began with the essay film, Letter to a Child and will culminate with Mom, now in progress. Dad, Škafar’s debut feature, garnered this writer-director-editor great esteem when it was chosen (along with the work of only six other filmmakers from 200 submissions) to open at the Venice International Critics Week of the 2010 Bienalle, and since then and has been lauded at numerous festivals abroad. At home Škafar has been a proactive advocate of the art of cinema: he was one of the founders of the Slovenian Cinémathèque and headed its Programme Department from 1994-1999. In 2004 he launched the Kino Otok - Isola Cinema International Film Festival. Maybe it all started looking at a sad figure of a man, which you can sometimes see even in the face of a boy. The face of a prince, the male descendant, around which the whole world revolves in our societies. Then he has increasing difficulties with finding his way around in this world, sinking into loneliness and ending up more or less miserable, physically as well as socially. Because he doesn’t know how to love. He is used to receiving and then he doesn’t know how to give. He is used to getting and then he doesn’t know how to search. Dad is a quiet gem that transfixes audiences in its spell of longing on the part of a father and son for each other. 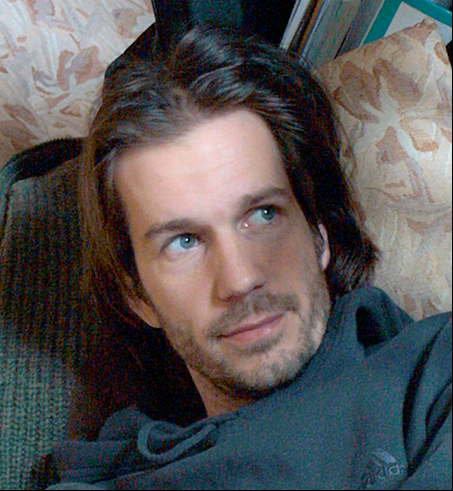 The central roles are persuasively inhabited by two lay actors, Miki Roš (a machinist with experience in the theatre and the cinema who also co-produced the film) and Sandi Šalamon (a raspy-voiced pre-teen philosopher), who rehearsed for six months with the director using various approaches to mine their own experiences in search of authentic details that they then re-enacted before the camera. The film transpires at Bukovnica Lake in Prekmurje, near the city of Murska Sobota in eastern Slovenia not far from the Hungarian border. There the grace of the beech trees and respectful silence of the water beckon the words, hesitant and sometimes clipped, at other times candid, between the prematurely pensive boy and the man he astonishes. The two take stock of each other and test their rapport, as if by trial and error; meanwhile, visually on the screen, as one shot transforms slowly into the next, “there is enough time in-between to allow the soul of one image to mingle with that of the other,” Škafar suggests. The tentative intimacy that emerges in nature is both the core and the shell of the film, but it implodes with unexpected dimension in what at first seems to be an epilogue. Here both the documentarist and the lyricist in Škafar impart the father’s working world, at once precarious, demanding, and alienating, that hovers so ominously over the balance of Dad. Water bugs on a bright blue screen make ripples as they chase, touch, repel; each point of contact looks like a sporadic collision. Shot from above at a middle distance, their movement presents the pattern the film will take, resounding as a father and son spend one precious day fishing together, perhaps for the love they may have lost. And on this autumn Sunday as they cast and reel, Vlado Škafar positions us within the very interstices of the film’s changing frames. So carefully calibrated that the work achieves the opposite effect — of the utter unpredictability and evanescence of family bonds — Dad is uncanny in its emotional precision. An insect web, first its reflection in the lake and then its gossamer reality, draws our eyes to a chrysalis, suspended in space and time. Not until five minutes into the film do we hear a word, which is spoken only in voice-over by the father, we assume, who is dwarfed in the distance of the forest thicket as his son stands apart down the shore. The man’s figure, “untangling” fishing line in the air, dissolves slowly as another figure of him simultaneously emerges a few feet closer to the boy. Two dads. One coming, one going. One who swigs from a flask and lights a cigarette, one who asks questions about trees and feelings. What happened in the interlude? How many moments passed? Nature is the only witness in this isolated world where the tempo and meter follow the tick of the heart as this boy and man mark their own rhythm. Deep in the woods, we take up the invitation to contemplate their cautious, conscious, awkward steps to build a fluid bridge between them. The Mexican Paz and the Slovenian Škafar are both poets and essayists: one uses words and punctuation; the other, images and montage. Both artists seek to recover a unity of man and nature, mind and body, “I” and “you.” To this end, we are hard-pressed to find a single actual “cut” in Dad, a canvas that relies on its dissolution of images both conceptually and logistically. The film’s montage is layered, not linear, suggesting the possibility of symbolic fusion. Yet while the ceaseless ebb and flow, the reflux and return, of Škafar’s figures fading in and out of landscapes and skies grants them a heavenly diaphaneity, their ghostly forms, even when stripped of pretense and deceit, never simply meld. They move through each other, like settling and lifting fog, not so much as ellipses or lapses but as memory-sensations in an eternal present. 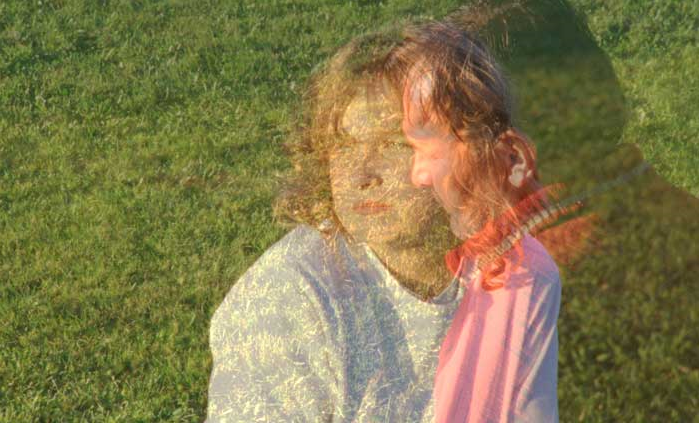 Time itself accrues no advantage in the rarefied air of Dad’s frames; rather, it sways like a prism refracting the light of the characters’ feelings, some hidden or long buried, now emitted in immense fragility. Škafar employs each prolonged double exposure not to compress time, so as to serve the economy of storytelling, but to expand a moment as if to create an ethereal haven for two spectres to meet. Strangely, then, screen time becomes screen space. …films have the possibility and freedom to perceive time in its natural state, which is completely abstract. Without direction, without duration, beginning or end. Therefore transitions in my film are in fact not transitions in time, but constitute independent intermediate scenes (they are also so long that we could probably refer to them as double expositions). Throughout the film, the master shot and the shot/reverse-shot conventions are dropped in favor of poetic allusion or evocation, though never mystification. The disembodied voices of the father and the son are heard as the two of them lie on the grass. The conversation flows naturally, but the dialogue could have originated in another scene, even one long ago. Stretched out with his schoolbook, the boy (or at least his voice) reads a scientific explanation of the formation of clouds. His voice fades out just as a close-up of the father dissolves from his head on the grass to his head in the sky; meanwhile a dad’s voice fades in as if charming a child with a bedtime story of dwarfs using the stars as tiny lanterns while painting the clouds at night. Is it a memory? A reflection upon the boy’s present activity? A wish for what might have been? Škafar separates the film’s sequences by fades to black, thereby exposing rather than covering the gaps between them and reinforcing the notion that the scenes might be parallel, elaborative, contrapuntal, or rhyming, for example, rather than proceeding as a chain of events. 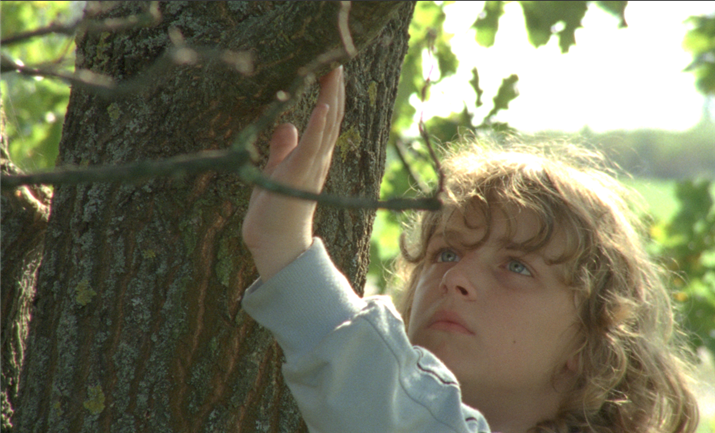 On occasion the director opens a scene with a close-up but no establishing shot to clarify a spatial relation: the boy walking passionately through the woods, for example — straight at us, his gaze fixed on us and the camera that keeps apace with him by backing away as he would seem to reach out — heightens the intensity of feeling more than the suspense in a plot. Likewise, panning across a line of workers outside a factory without ever establishing that it is the factory location and without visually identifying the speaker to whom the men all listen suggests the unity and togetherness of this extended “family,” a social class; in this way the individual father is seen within the relative universality of his peers, accentuated when the camera then pans to a man’s folded hands, for instance, eliding his face. The editor Škafar works as a chemist of emotion, dissolving the concretion of a pearl to explore the sands and waves that made it. That jewel might be a marriage, a birth, a love affair, a re-acquaintance with nature — all are enhanced by an association of images and sounds. Ultimately, with considerable panache, the director risks two quite opposite departures from the overarching tone of his film, one a diatribe and the other a song — the former a jarring and bracing thorn in the tender but hopeful melancholy of the father-son reunion, the latter a boldly lyrical brushstroke against the swath of socioeconomic ills registered near the film’s end. Neither would be so convincing, so impacting, without the softer scene directly between them of the father sitting at a café with his cronies. The man, until now reticent, overtly commands their camaraderie and our empathy as he tells of his love of people, of nature, and his former work as a forester, when he named all the trees he planted after Tolstoy’s characters and walked in the woods as if it were his family. This beside his alienating new night job as a security “spy.” There is nothing extraneous about this scene; it plays as an old bridge over a stream that lets us see, as if for the first time, the boy in the man, and thus, all that is the dad in the son. Like a drainpipe of despair rather than a mystery solved, the scene culminates the film without a cadenza; rather it opens to an homage in a song over the end credits that offers some of the clearest and most memorable notes of Dad. Admiration for Dad at festivals has alluded to Sokurov and Tarkovsky (certainly their theories of cinematic time and their languages for expressing familial love apply), but more explicit comparisons might be found in Un Lac, Philippe Grandrieux’s near mythic portrait of transitional family roles deep in a forest, and in Manoel de Oliveira’s The Strange Case of Angélica, in the direct-to-camera gazes of real agricultural workers whose labor is honored, interspersed with the other-worldly visions and flights of the film’s two main characters, the photographer and his muse. These also recall Fridrik Thór Fridriksson’s Angels of the Universe from Einar Már Gudmundsson’s poetic biography of his deceased brother and friends. That early film as well as Fridriksson’s more recent Mamma Gógó bring lost ones to life in fanciful figurations similar to those in Dad. 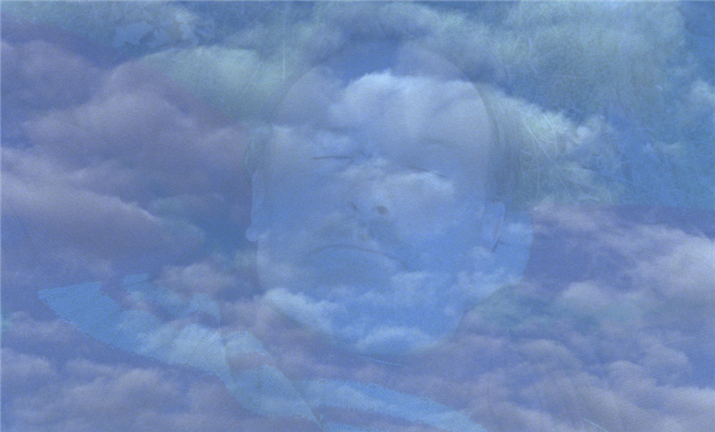 Dad can also be seen through the reverberations of Ozu’s frames, extended by off-screen sounds that enlarge the social context of an intimate encounter, and through the dark mystery and isolation of Zvyagintsev’s The Return and the angst and longing of Ceylan’s Clouds of May (both works whose young, novice actors died in sadly ironic ways near the sites of their films, almost as if still in-character, just as they were earning their laurels at international festivals). Yet Dad lives most beautifully in its own light, with sensitivity, imagination, and courage of expression that can be traced directly to Vlado Škafar in his unforgettable first feature film. Director: Vlado Škafar; Producer: Frenk Celarc; Screenplay: Vlado Škafar; Cinematography: Marko Brdar; Sound Design: Julij Zornik; Editing: Vlado Škafar; Art Design: Sonja Prosenc; Music: “Für Elise,” Ludwig Von Beethoven, performed by Sandi Šalamon; “Nature Boy,” performed by Nat King Cole; “Ljubav se ne trži,” traditional, performed by Nina Romič. Cast: Miki Roš, Sandi Šalamon, workers of the Mura factory. Color, 35mm, 71 minutes. In Slovenian with English subtitles.